In the movies you see people falling into water after getting shot all the time. But apparently that also happens often enough in real life for someone to develop a bulletproof vest with an auto-inflating air bladder to keep someone afloat if they’re injured or unconscious. A bulletproof vest will prevent a round from piercing the wearer’s body, but the impact of getting hit by a projectile moving at twice the speed of sound is still incredibly severe. If the person doesn’t have the wind knocked out of them, they can still suffer internal injuries making it hard for them to swim or stay afloat if they suddenly find themselves in the water. So BCB International’s new FATS—or Flotation Armor Torso System—helps keep military or law enforcement personnel alive no matter how a situation plays out. Like other military gear, the vest features MOLLE straps for securely attaching supplies and equipment. And its hidden inflatable bladder, which gets filled with a small CO2 cylinder, is large enough to keep both the wearer, and the equipment strapped to them, afloat. Quick release buckles on the vest automatically open as it inflates so there’s enough room for the expanding bladder. 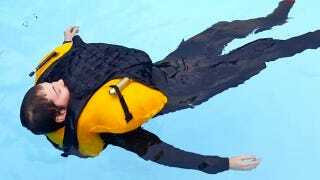 And like with life vests, it’s designed to be self-righting to ensure the wearer’s air ways are always kept out of the water. With a price tag just north of $1,500, the FATS vest also isn’t obscenely priced. Which is important because no matter how well designed it might be, it can’t protect an officer or a soldier if it’s too expensive for a unit to buy them.